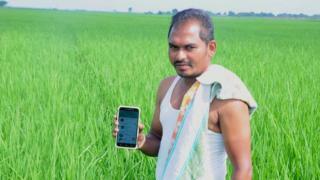 Image caption Voruganti Surendra says farmers are finding pest and disease recognition apps "very useful"
India's farmers have never had it easy; drought, crop failure, low market prices and lack of modernisation have taken their toll on the nation's population, about half of whom work in agriculture. "It is very useful," he says. "Farmers need it." "It was really important for us to understand what farmers wanted," says Charlotte Schumann, co-founder of Peat (Progressive Environmental & Agricultural Technologies) the company behind the app, "so we did a lot of groundwork in India". "The smartphones gave many of them access to the internet for the first time," says Ms Schumann. There are 500 or so farmers in Mr Surendra's village of Karlapalem in Bapatla Mandal, growing rice, maize, cotton, banana, chilli and a host of other crops. "It works a bit like the human brain," says Peat's chief executive, Simone Strey. "Obviously, it needs some backup from human experts," says Ms Strey. The app had to be multi-lingual because "the farmers often use different names for crop diseases than those used by scientists", she says. "And if the farmers don't know the scientific name, they won't be able to search for solutions online." In Africa, for instance, the Consultative Group on International Agricultural Research - a body dedicated to food security - has just won a $100,000 (£76,000) award to expand its research and bring a similar app to farmers across the continent. David Hughes of Penn State, who co-leads the project, describes it as "transformative" and says they "can amplify by 100 times what we have achieved so far". In fact, the number of digital helpers that can fit in farmers' pockets has grown dramatically in recent years. They include fertiliser firm Yara's ImageIT app, which uses photos to measure nitrogen uptake in a crop and offer recommendations to farmers. University of Missouri's ID Weeds app helps farmers identify unwanted plants. And John Deere's GrainTruckPlus app helps with grain harvesting storage and fleet logistics. Then there's PotashCorp's return-on-investment calculator, called eKonomics, and AgVault 2.0 Mobile's Sentera app, which controls drones that can systematically film entire fields autonomously and feed back the footage for analysis. "Technological innovations play a very important role," says Harsimrat Kaur Badal, India's Minister of Food Processing Industries, in reducing waste, improving hygiene, creating jobs, and addressing "farmers' distress". Krishna Kumar, chief executive of CropIn Technology, a data-driven farming company, believes agricultural "start-ups [will] innovate fast and change every aspect of the industry". While such apps are practically useful to farmers now, it is the data they collect that is potentially more useful in the longer term, argues Peat's Ms Strey. "Each farmer represents a data point, and it's really the data set that's valuable. Research on this scale in this field hasn't been done before by any global research organisation." This is why farmers don't usually have to pay to use such apps. "If you want to collect data, you don't make the users pay," says Ms Strey. Could a hacker hijack your connected car? Peat's database currently contains some 1.5 million images - up from 100,000 a year ago, with 80% of its 300,000 to 400,000 users currently in India. As such, the challenge, according to CropIn Technology's Mr Kumar, is not merely to gather the data, but to "make sense of it and present it as actionable insights to agri businesses".